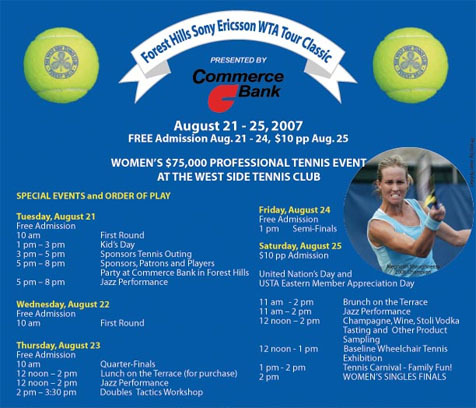 The West Side Tennis Club is well known for hosting the US Open Tennis Championships. Today, it is home to 825 members, maintaining the best of our celebrated past and rich history. The West Side Tennis Club often surprises first-time visitors. Anchored by its historic stadium, the renowned Tudor-style clubhouse, along with a junior Olympic pool complex, West Side’s 14 acres are both a majestic setting and a tranquil oasis in the heart of New York City. It is just 20 minutes from the bustle of midtown Manhattan, easily reached by car, bus, subway or the Long Island Railroad. West Side maintains 38 tennis courts on four different surfaces: Grass, Har-Tru, Red Clay and Deco-Turf and provides year-round tennis utilizing its 10-court indoor facility. Members can take advantage of group or private lessons. Clinics, tournaments, ladders, arranged matches, round robins and a year-round junior program including summer camp, pro shop and swimming lessons. The West Side is host to ATP Challenger Events, WTA Tour Events, the national Senior Women’s Grass Court Tournament and Level 1 Junior Tournaments.